The hotel is in city centre, in immediate proximity from all necessary points of service which can be necessary for visitors. In front of hotel there is a cosy square with a fountain and alive music in summer days. In two kilometers there is the shined ski line. It is possible to park a car there. 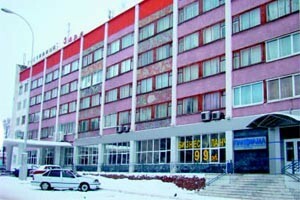 The hotel has own taxi, we render service of a meeting of the visitor from road service station or the airport in Ufa. Number fund of hotel Zarya makes in total 56 numbers (112 places), including 1 number luxe, 12 junior suites, the price of a place is among 480 and 5000 roubles for a day (24 hours). The cost of number includes the breakfast. On a ground floor of the hotel building there are restaurant Panorama, cafe Yakor, a hairdressing salon, beauty salon, travel agency, a photo salon, billiards, a laundry. Also on the third floor there is a cafe specially for visitors (Work-time 7 a.m till 10 p.m.). Our hotel favourably differs the arrangement in a silent, cosy, picturesque place, far from a highway, unlike such industrial cities like Salavat, Sterlitamak which visitors prefer to stop at us owing to the low prices at the best service and ease to reach the industrial enterprises of these cities (Sterlitamak is 30 km away, Salavat is 15 km away – it will take about 15 – 30 minutes to get there). In this respect Ishimbay is very convenient for travellers, the businessmen working with such giants of the industry, as Open Society Salavatnefteorgsintez, Open Society Soda, Joint-Stock Company Kauchuk, etc. Therefore, coming to Salavat, Sterlitamak, Ishimbay, stay at us. During existing time of the hotel greater work is done, but we are not going to stop on reached. We have a lot of plans for improvement and expansion of a spectrum of services, in particular, automation of hotel services that will allow to raise a degree of it.